Harry Goldfine #76 (right, in STROH driving suit) and David Byrka #78 (left in blue driving suit) and their race winning Fire Arrows. 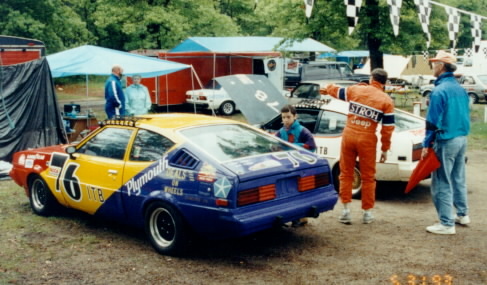 Harry and his nephew, David Byrka, began ice racing in 1988 with a Saab Sonett V4. When Harry was called away to Desert Storm in 1991, the Sonett was put away. On his return, Harry and David decided to invest in a Summer racer, and purchased a Plymouth Fire Arrow that had been a PRO Rally car. A few years later, Harry bought another Fire Arrow and sold his share in the first one to his son, Jason. 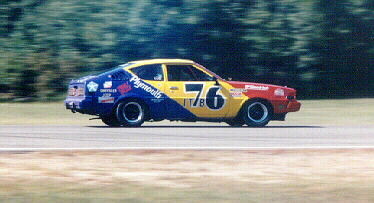 Harry has several wins in ITB, at Brainerd International Raceway and at Road America. 1996 was not exactly a banner year for Harry. He started the season with a new engine in the Fire Arrow, but it blew during a race at BIR in June. In July, he went wide in the Carousel at Road America and damaged the front end. He was able to finish the season with a 1st place at BIR on Labor Day. Harry recently retired from teaching Physical Education at Morgan Park Junior High School in Duluth. His wife, Peggy Friedman, works at Great Harvest Baking in Duluth. Their son, Joe, is active in youth hockey.